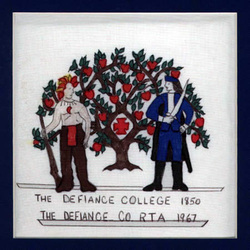 To represent the Defiance County Retired Teachers, we chose the seal of the Defiance College. It shows a native American and a white general who were historically in defiance of each other, hence our county's name. The apple tree represents Johnny Appleseed, important to our story, and the apple, a symbol for a teacher. The cross is an indication of the faith of most of the people in Defiance. The Defiance County Retired Teachers has a membership of almost two hundred. Many of us continue to be active as volunteers and still make an impact in our home community.